Myriad Genetics | Patients & Families | Do I Have Disease? 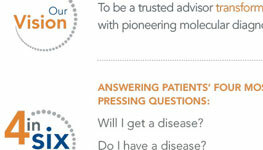 Patients & Families > Your Questions About Disease > Do I Have A Disease? At Myriad, we’ve seen the power of genetic insight to expose cancer risk and change lives. We set out to answer the need for greater certainty in diagnosing melanoma. Myriad myPath® Melanoma is a new test that is available to help dermatopathologists make a more definitive diagnosis. When you find a suspicious mole on your body, you make an appointment with a dermatologist to have the mole examined. If the dermatologist deems it necessary to remove the mole (skin biopsy), the biopsy is then sent to a dermatopathologist for evaluation. Learn more about Myriad myPath Melanoma. 1. Shoo B, et al. Discordance in the histopathologic diagnosis of melanoma at a melanoma referral center. Am Acad Dermatol 2010;620:751-6. 2. Lodha S, et al. Discordance in the histopathologic diagnosis of difficult melanocytic neoplasms in the clinical setting. J Cutan Pathol 2008;35:349–352. 3. American Cancer Society. www.cancer.org. Accessed December 2013.